This event was organized by the Lithuanian Geographical Society (a member of CIVILSCAPE). There were contributions from the Lithuanian Geographical Society, Ministry of Environment, CIVILSCAPE and Vilnius University and also about implementation of European Landscape Convention in Lithuania and NGOs initiatives concerning landscape. LIFEscape project was presented and represented by Zemaitija National Park and many of the international partners. Motto of this tour organised by the Żemaitija National Park was "By the drops of water". Highlight was the opening of the exhibition „The best Lithuanian landscape projects in 2012“ which was visited by 52 participants. There were presesntations about landscape issues, in the context of e.g. shale gas extraction. The event featured a music and folk dance programme. Landscape Architecture department of the Klaipeda University together with the Pajurio Regional Park organized a seminar and discussion about „Wooden architecture in protected landscape areas“. Some 50 invited guests from science, architecture, representatives of the protected areas, landscape planning and municipal specialists took part. Contest of photos, pictures and compositions about the landscape of Zemaitija National Park was organized among children in local schools. 35 participants took part in this contest. All works were exhibited and winners celebrated in the final event "My park. My passion. My history" on the 24th of May. The University of Klaipeda, in cooperation with the ŽNP, were jointly responsible for hosting the 3rd international LIFEscape meeting. 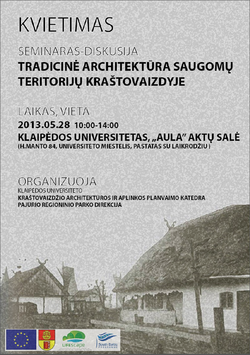 The University of Klaipeda (Marine Landscape Research Institute) organised an open conference under the title „Provisions, implementation & problems of the European Landscape Convention shaping the landscapes in Western Lithuania”, were both the project was presented and partners could learn interesting facts from the Lithuanian landscape planning theory and practice. On the second day, a study trip to the pilot area was organised. After visiting the regional museum and getting a glimpse of the wonderful landscapes of the Żemaitija National Park, participants attended a workshop moderated by Per Blomberg of the Lund Commune. It gave everyone a chance to experiment with some stakeholder participation methods, such as various ice-breakers and the open-space method. Located inside the Žemaitija National Park, the pilot area has outstanding natural and cultural values. But the region faces growing pressure from construction activities and tourism development. Realisation of the LIFEscape project in the Žemaitija National Park is an opportunity to dicuss and stress the landscape topic in the daily work of the Park. With the help of innovative methodologies, such as the use of 3D visualisation tools and interactive landscape maps, a landscape management strategy will be created in cooperation with stakeholders. Nine meetings with stakeholder focus groups have been organised, including with municipality authorities, tourists and other stakeholders. Also meetings/workshops for children were offered with big success.